Pressing glass - what does that mean? Pressed glass has been known for millennia - there are a couple of extremely thin shell-shaped bowls from Egypt, dated to about 1300 BCE. In the book 5000 years of glass, they are described as "undoubtedly cast", but how does one "cast" a super thin bowl? About a thousand years later: small plates with a pattern on the underside, dated to about 500 BCE. There are several finds of this type from Persia. Of course it is not known exactly how they were made, but they are made in a mould, and they are thin, so they are obviously not made in the way we today understand with "casting". Also, they are not blown, since the blowpipe, as far as we know, was not yet invented. There are also many examples (from earliest times up to now) of cast pieces patterned with stamps, but those can probably not be called "pressed". Forward two thousand years, and we land in Sweden in the 1700s: now we first find the word "prässat" (pressed), but it is thought that by that, at that time, was meant either cast (ie a solid piece of glass cast in a mould, for example bottle stoppers) or, somewhat later, what we today describe as "fixed mould" blowing (as opposed to the usual practice of rotating the piece in the mould, for maximal smoothness). As can be seen in the right-hand picture, fixed mould blowing is still practiced. 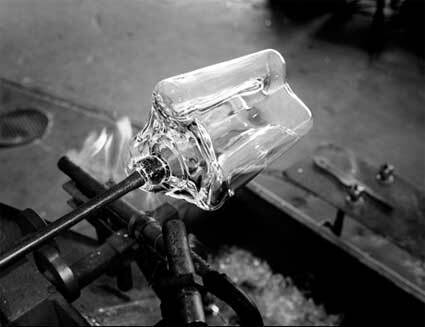 The picture shows a vase by Alvar Aalto, made at Iittala glassworks in Finland. These vases are still made by hand. 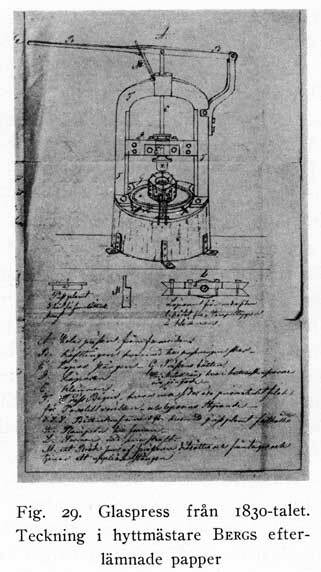 The early 1800s in the USA: glass presses were invented, with the idea of making production more efficient. There were several patents filed from 1825 and for 5-10 years after. Presses were introduced in Europe, and the news soon reached Sweden. According to several stories (unfortunately not fully supported by facts) one Joachim Åkerman was sent out scouting in 1834. He came back, but with what? a whole press, a sketch or a drawing, a model... - the stories vary. But: in 1836 Reijmyre glassworks was the first glassworks in Sweden to get a hand-press (with the help of said Åkerman). Other glassworks soon got their own presses - in 1839 Kosta got one. The early presses and/or moulds had several problems, but after some time nearly all Swedish glassworks were producing pressed glass pieces. The drawing to the right shows a different model - here, the plunger arm is mounted on top. Modern presses usually have the arm on the side. - The earlier side-arm presses had several problems. Strömberg (Kostaglaset 1742-1916) writes that Kosta glassworks had to give up on the side-arm press, and re-institute the older model. In the beginning, pressed pieces often had all-over patterns - this disguised bad glass: threads, bubbles and other faults were not as visible if the whole piece was patterned. Sometimes the pressed pieces were used as blanks for cutting; it was faster, and there was less need to cut away a lot of material to get the deep cuts. There were many clever ways to use one mould to make different products: the "bowl" coming from the press could be used as is; it could be re-heated and flared to make a plate (or other forms); could be given a stem - it could even be given different stems, and thus be sold as different products. There are many examples of complicated moulds: cream jugs could be pressed complete with a handle, saltcellars like the one shown here. 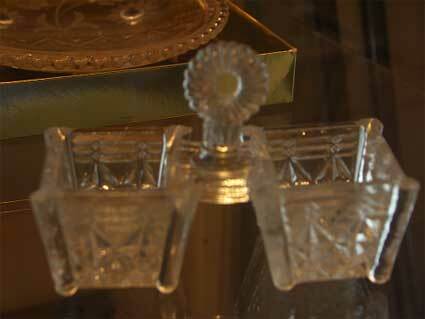 Pressed glass - but surely, that isn't made any longer?!? Many people think that the heyday of pressed glass was the 1920-30ies - but that depends on one's point of view: today presses are fully automated, but they are still used in the art glass industry - Snowball, a votive from Kosta, is one typical example. It is said that Reijmyre still uses a hand press for parts of their permanent range of products.